Although this marks the beginning of chapter three in terms of my dissertation, it’s really here that my academic journey began. Having been raised in the relatively passive and mystically oriented environment of Catholicism, I later became involved with Protestant evangelicalism which stressed one’s individual decision in the process of salvation. I lost my faith among the evangelicals; or rather, it was here that my capacity to think about faith was awakened, then frustrated in a way that I could not understand at the time. Looking back, the trouble for me was that the individualistic element in evangelicalism was stressed so much that the element of mystical participation that I had received from Catholicism was lost. What I was left with was a rationalized form of religiosity. It moved on the surface of life but had difficulty making contact with the depths. What I mean by this can be seen in the shape of the existential crisis which occurred in me during that time. The form of this crisis was the impasse created by my unconditional drive to affirm the meaning of my life as revealed in the love of Christ, colliding with my likewise unconditional drive to arrive at the truth concerning the historical ground of that fundamental affirmation. Did what was said to have happened, really happen? If, as my evangelical friends believed, the truth of the former rested on an affirmative answer to the latter, then the honest doubt would always be a corrosive force on the meaning of my life. Under these conditions there was no way out, for the truths of history are impossible to be known without the criticism of doubt. It was here that the work of Paul Tillich was introduced to me. His writings did something to me that no other religious writers I had read to that point were able to accomplish. He united the mystical, participatory dimensions of Catholicism with the individualistic, prophetic dimensions of Protestantism in the form of a paradox. Bringing this movement to light will be the goal of this chapter. In terms of my own story, this can be seen in Tillich’s statement that “Jesus could not have been the Christ without sacrificing himself as Jesus to himself as the Christ.” This was a revolutionary way of encapsulating something I had sensed but could not find the words for. Pace my evangelical friends, Jesus as the Christ is not a stable historical ground on which one might try to anchor one’s faith. Instead, the image of Jesus we get from the gospels is of one who deflects all attempts to make him an object of temporal security. In the terms of first century Palestine, that object of temporal security was thought to be the emergence of a sort of spiritualized king capable of throwing off the Roman occupation and ushering in a utopian reign of God. This figure was to be the “anointed one,” meshiah in Hebrew, or in Greek, christos, the Christ. Tillich helps us see how radically Jesus transformed these titles. His kingdom was “not of this world” in the sense that he served the eternal Father whose compassion extended to all, even the Romans. As such, his kingdom could not established according to the divisions of this world. In fact, any mindset that sought security in this-worldly terms would either be deflected by Jesus or be forced to kill him. For this reason both attempts to accept Jesus or to reject Jesus in this-worldly terms amounts only to seating oneself with the opposing side. The life of Jesus is an embodied paradox. Because of that, as Tillich continued, “any acceptance of Jesus as the Christ which is not the acceptance of Jesus the crucified is a form of idolatry.” (The Dynamics of Faith, 122.) And likewise, any denial of Jesus as the Christ with the affirmation of Jesus as the crucified is a form of faith. This is a puzzling way of speaking. For now, simply allow these words to be suggestive hints at what will soon be explained with more precision. In this chapter, by way of Robert Scharlemann’s analysis of Paul Tillich’s theology, I will be seeking to show how the paradox of salvation appears in the dimension of reason. The themes of the terror of death and stage transition will once again be in play. In the dimension of reason the terror of death emerges in the form of doubt. Though doubt can be used as a form of self-protection, I will here be focusing on doubt as it pertains to our deepest commitments and hopes. Self-protective doubt is truth-avoiding, whereas the form of doubt I will be addressing is truth-seeking. The difficulty is that, from a temporal perspective, to encounter truth is simultaneously to encounter death. Thus truth-seeking doubt is often something we avoid. The argument that will be presented is that, like psychological development, reason proceeds through stages where the reflecting subject is progressively “lost” as the structure of reason deepens and the scope of doubt increases. This post is a continuation of a series in which I make use of the blogosphere to motivate my dissertation free-writing. For context, read the short summary of my work here. There you will also find a table of contents with links to all the posts in this series. 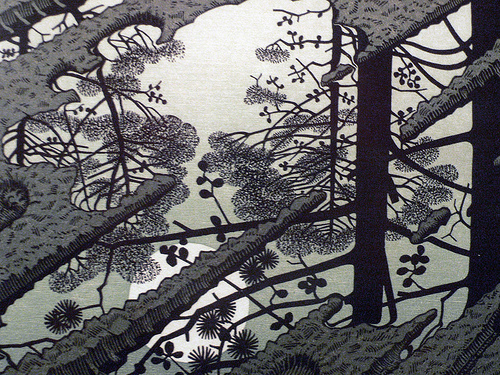 It seems to me that I must have been somewhere between Kegan’s “traditionalism” and “modernism” at this time. I was developing the capacity to by my own person in a way distinct from my earlier culture of embeddedness (Catholicism and my familial norms), but I was not yet able to hold my new developing ideology (evangelical Protestantism) as an object of reflection. It’s categories simply were “the” categories for me. 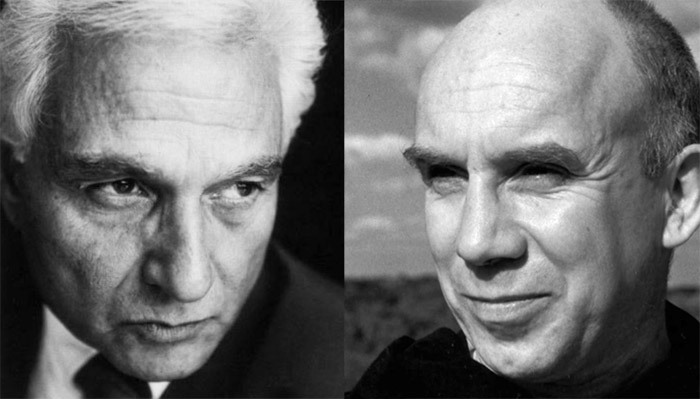 Jaques Derrida and Thomas Merton have much in common, which is interesting because, on the face of it, they shouldn’t. One was a destabilizing atheist philosopher, while the other was an activist and Benedictine monk. The only way prevailing habits of mind are able to relate two men bearing labels such as these tends to be by imagining them behind their respective podiums, ready for another sensational debate (much like the “creation debate” I recently wrote about). “Prevailing habits of mind,” however, have much to learn from these two figures, but it’s not going to happen from a podium. I also remember hearing the name Thomas Merton during those years. Merton was not someone that we personally read; rather, he was someone read by some of the spiritual writers we read. We learned of him as a name reverently dropped from their lips. Something to do with “seven stories” and a mountain. In any case, it would have never occurred to me then that he and Derrida would have anything at all in common, especially something so deep as the heart of their religiosity. The other morning a friend of mine, Sara Lynn Wilhelm Garbers, drew my attention to a wonderful interview with John D. Caputo in the New York Times by Gary Gutting. Caputo is a “postmodern philosopher” and Derrida scholar. The interview was very engaging, as Gutting continually pressed Caputo with the sort of questions that an informed evangelical might ask. In turn, Caputo did his best to show that the truth deconstruction is after is deeper than anything our settled concepts can grasp. For deconstruction, truth is always a moving target. As such, what Caputo calls Derrida’s “religion without religion” is likewise intended to be a dynamic idea rather than a settled label. The paradoxical form of this phrase immediately deconstructs itself. Whatever “yes” is stated is immediately followed by a “no.” If you try to resolve “religion without religion” into religion—“ah! So Derrida really is religious!”—then the “without religion” rushes in with its “not so fast!” The same operation occurs from the other direction if the phrase is resolved into “atheism.” Its paradoxical form is always drawing us in, but forcing open our conceptions. The goal of this operation is to foster an endless attention that is at all times actively disrupting our complacency or pretension. Is there any positive content to his view of religion or is it all just “negative theology”? Is he in any sense “making a case” for religion? 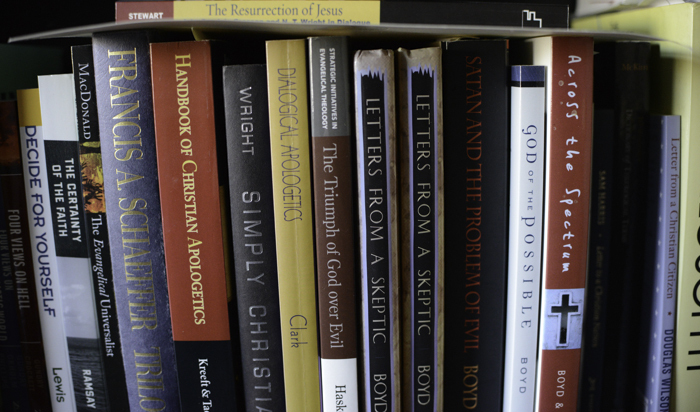 Can reading Derrida lead to religious belief? The phrase “just ‘negative theology’” is telling, but the concern behind the phrase is understandable. In response Caputo does his best to describe the elusive positivity that necessitates the negativity. Here we have the positivity that deconstruction presupposes. Deconstruction seeks the yes by way of the no. “The authentic,” the “really real” emerges, though is never grasped as a possession, by way of a constant “spinning,” a dismantling of the adequacy of our settled approach to it. With that in mind, let us now turn to the words of Thomas Merton. Again we will see the negativity and underlying positivity in his words. The true solutions are not those which we force upon life in accordance with our theories, but those which life itself provides for those who dispose themselves to receive the truth. Consequently our task is to disassociate ourselves from all who have theories which promise clear-cut and infallible solutions, and to mistrust all such theories, not in a spirit of negativism and defeat, but rather trusting life itself, and nature, and if you will permit me, God above all. “Letter to an Innocent Bystander”, in Raids on the Unspeakable, 61. Merton calls this underlying positivity “God,” but it cannot be stressed strongly enough, that, for Merton, “God” is not the settled answer to the question. Merton is rightfully called an atheist to the extent that theism is construed as a settling of the question of existence with the answer “God.” God is just as much the positing of the question as the answer (a point I have tried to make clear in a previous post). This is integral to his reasons for arguing that “our task” is standing against any who presume to have settled answers. Like Caputo’s stress on the “yes” behind deconstruction, Merton also urges that the critical posture of the activist is not birthed from mere “negativity,” but from trust in the ongoing rationality that constitutes our very being. A rationality that, viewed from one angle, can never be spoken, and yet, viewed from another, underlies all speech. The “spinning” never ends, but it can be entered into faithfully, in hope, and in love. For both Derrida and Merton the situation is similar. A distrust of human pretension and complacency is the proper response to the encounter with a truth that emerges as gift rather than possession (a place we might “land”). God’s “yes” implies a “no” to any and all complacent or pretentious human attempts to claim truth solely for its own deployment. To be among “those disposed to receive it” we must live in attention, ever awaiting truth as gift. For my part, it has indeed been a gift to see at least one way that that these two ostensibly “ancient enemies” have a bit more in common than I’d once been led to believe. Ever since I started hanging around evangelicals (12 or so years ago) I’ve noticed—among a whole host of laudable and praiseworthy qualities—a persistent anxiety within their culture. You can hear it in their sermons and their songs. You can see it in the sorts of books they read (or don’t read) and movies they watch (or don’t watch). On an academic level it becomes even more acute when you read their bible scholars and theologians. What is this anxiety to which I refer? As I see it, it is that anxiety which is born from the tension between the meaning of life and the unity of truth. Similar (but less adequate) ways of putting it would be the the tension between: faith and reason, the Bible and science, theological conservatism and liberalism, “Bible believing” Christians and those who entertain critical biblical scholarship, etc… Those experiencing this anxiety are faced with a strong temptation to settle for a fretful ideology, rather than a vibrant and integrated faith. There is the worry that following our questions too far may lead to the undermining of our faith. In this post I intend to explore this dynamic. A constructive response will be the task of later posts. 4. Interpretive success is dependent upon attention to context. A fifth proposition that I’ve heard tossed about in evangelical circles regards one of the two poles of the tension we are exploring. It may not be as common of an emphasis, but I doubt that many evangelicals would find it to be controversial. With this fifth proposition in place we are now in a position to see the basic problem: If the meaning of our life is found in our embrace of the gospel of Christ, and if reception of that gospel is based upon faith (understood as believing the factuality of certain things), and if these “certain things” are derived from Scripture, then we ought to read and believe Scripture. If, in the process of reading Scripture, we are taught to take context seriously, then we will ask questions. But if one asks enough questions, one will eventually discover that most biblical scholarship doubts the factuality of much that is recorded in the Bible (even evangelical scholars are beginning to accept this), and they have many good reasons behind their doubts. Did you feel your blood pressure just rise? If you did, you are likely steeped in the dynamic I am describing here. Your intuitions regarding the unity of truth are being opposed to the meaning of your life. This is a scary place to be, for it appears that one or the other will have to be be abandoned. It is this anxiety, combined with an unwillingness to abandon what has become the deeply felt meaning of one’s life, that causes many evangelicals to accept the second horn of the dilemma and vigorously oppose (or systematically ignore) nearly all biblical scholarship. On a larger scale it is this same dynamic that drives the evangelical opposition to science. Just like biblical scholarship, scientists offer good reasons to doubt a straight-forwardly historical reading of a number of cherished biblical texts (Most obviously, the creation narratives). What I want to be clear at this point is that I’m not concerned to debate whether or not scientists or biblical scholars are correct in their assessments (although I tend to think they are likely on the right track). Instead, I want to call attention to the way hitching the meaning of our lives to a problematic view of faith leads to a fear of vigorous inquiry into any and all questions of interest. If faith is understood as believing in a certain set of facts that have occurred “out there,” or “back then,” then the meaning of our life will always be threatened by the possibility that asking too many questions will end up showing that “it just ain’t so.” This fear leads to a dis-integration of our person. Our rational capacities are tyrannized by fear. If in Christ we find “life abundantly” (Jn 10:10), and if that life encourages love of God with all our heart, soul, strength and mind, then a life characterized by intellectual anxiety is a deplorable situation. What I hope to show in the future is that this anxiety is not necessary. The meaning of our lives cannot be threatened by the unity of truth, for the meaning of our lives is a complex not exhausted by “external” reality. And so ends my analysis of the problem. I’ve done my best to articulate the mess as I see it. In future posts I hope to suggest a way forward. Contrary to what one might infer from the foregoing, I have a deep love for evangelicals. I think their emphasis on the personal and unconditional commitment to Christ offers something very important to the wider body of Christ. However, I’ve seen this zeal become directed in such a way that it threatens to “dis-integrate” individual evangelicals, as well as scare off thoughtful people who might otherwise be quite compelled to sympathize with Christian faith. As such, this ought not be read as an attack, but rather a labor of love. It is worth noting also, that this is often the same dynamic that brings about such heat in political disputes, for visions of the good are being opposed to each other. And our “visions of the good” are where we locate the meaning of our lives. About: whose blog is this? Living Through Death by Alex Blondeau is licensed under a Creative Commons Attribution-NonCommercial 4.0 International License.